In the popular imagination, the notion of military medicine prior to the twentieth century is dominated by images of brutal ignorance, superstition and indifference. In an age before the introduction of anaesthetics, antibiotics and the sterilisation of instruments, it is perhaps unsurprising that such a stereotyped view has developed, but to what degree is it correct? Whilst it is undoubtedly true that by modern standards, the medical care provided in previous centuries was crude and parochial, it would be wrong to think that serious attempts were not made by national bodies to provide care for those injured in the military conflicts of the past. 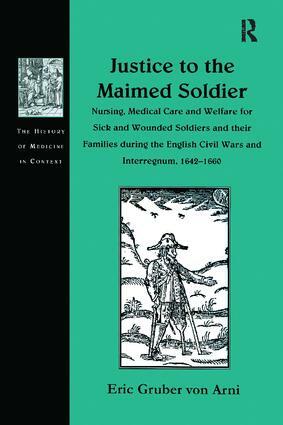 In this ground breaking study, it is argued that both sides involved in the civil wars that ravaged the British Isles during the mid seventeenth century made concerted efforts to provide medical care for their sick and wounded troops. Through the use of extensive archival sources, Dr Gruber von Arni has pieced together the history of the welfare provided by both Parliamentarian and Royalist causes, and analyses the effectiveness of the systems they set up.